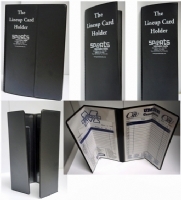 Our Lineup Card Holder was specially designed with input from coaches and umpires to securely hold 2 lineup cards. The Holder measures 6" by 9" when folded in half and further folds into a compact 3.5" by 9" so you can fit it into a back pocket or pouch. 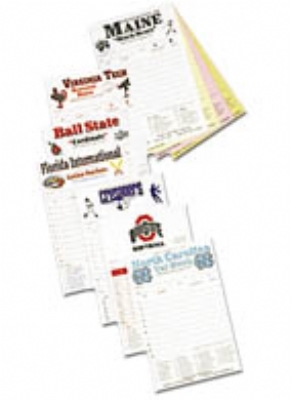 Sturdy enough to write on and make roster or position changes during the game, yet flexible enough to fold in multiple ways to suit your needs. Cards are held in place by plastic "triangles" in each corner on the top of the holder. Please Note: prior versions, like the holder shown in the video, had plastic triangles on the top and bottom of the holder but our new version introduced in March 2016 elminated the bottom triangles and only has plastic triangles on the top to accomodate different-sized lineup cards. Designed to fit our lineup cards which are 5.5" wide by 8.5" tall. Might not fit all sizes from other manufacturers. Our customers tell us that they like to use the holder by placing the lineup card in the top two triangles allowing them to "scribble" or make notations on the bottom!